The Junction is a sure fit with its five-point, adjustable harness for your little one and a simple torso-length adjustment system so that it fits both mom and dad comfortably. 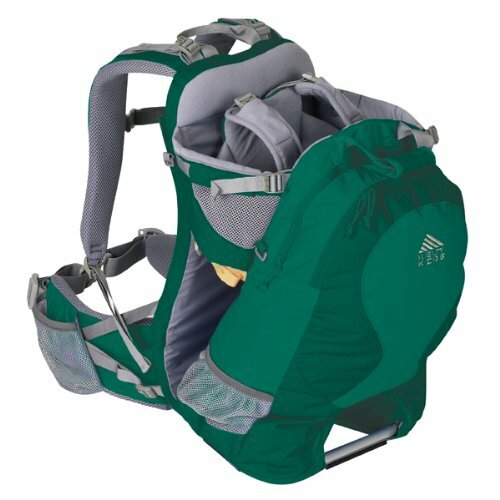 The versitile Junction is ideal for running around town hands-free or hitting the trail for an afternoon hike. Volume: 1300 Cubic Inches, 21 Liters Weight: 4lb 13oz 40 Pound Total weight limit. JPMA Approved Carries comfortably using 2-layer, padded and contoured waistbelt with curved, padded shoulder straps. Child stays comfortable with padded adjustable-height childs seat and can be entertained with toys attached to the toy loops. The Foot-Stabilizer at the bottom of the Transit provides a safe platform for loading and unloading your child. Added comfort and convenience comes from Organizer pocket, front storage pocket, and removable, washable chin-pad. Fits torso between 14"-18" (35.5-46cm).